The Irish Rugby Football Union (IRFU) has slashed ticket prices at the Aviva Stadium in the wake of a disappointing November blighted by poor attendances. Ireland's first Test at the newly-redeveloped Lansdowne Road, a 23-21 loss to South Africa on November 6, was played out in front of 16,183 empty seats at the 51,700 capacity ground following an embarrassing misjudgement in ticket prices. 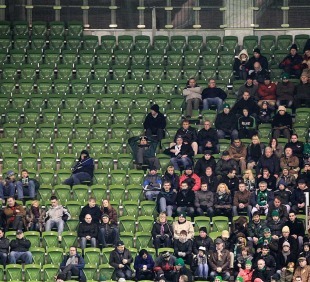 Forced to buy tickets in two-match packages, at prices of €190 or €150, many supporters stayed away as the effects of the recession continued to tell. Now, the IRFU has announced a revised ticketing policy for next year's Six Nations, when Ireland will host England and France in Dublin. The tiered pricing structure will see fans able to purchase tickets priced between €50 and €125 for premium tickets, although the majority of the 30,000 general sale tickets available are priced at €90. Schoolchildren will benefit from 1,800 tickets priced at €15. "In approaching the issue we were tasked by the union to come up with a pricing structure which would provide attractive options to supporters at various levels and secure capacity crowds for both France and England," Pat Fitzgerald, chairman of the IRFU commercial and marketing committee, said. "We also needed to be cognisant of the key role international fixtures play in generating the income required to manage and develop the game at both the domestic and professional levels."